God of War Director Cory Barlog sat on a PAX West 2018 panel alongside Kinda Funny’s Greg Miller, Kat Bailey of USGamer, GameHistory.org’s Frank Cifaldi, and Sydnee Goodman from IGN. Jared Petty of Hop, Blip, and a Jump hosted the panel, “The Quest for a Perfect Superman Game,” which pondered why we’ve yet to see a good Superman game. On the eve of Insomniac’s launch of Marvel’s Spider-Man, Cory Barlog shared his Superman game pitch. One of them is the totally obvious pitch of old man Superman has a kid and he’s trying to figure out how to teach him. That’s just me leaning into my last game. The second one is, I really, really love the Smallville television show and I really love the idea of playing with this concept of Persona. Young Clark Kent—you have to go to school but you also are also uncovering that you’re the greatest American hero with your powers and it’s a sort of awkward coming of age idea that you have to balance. Literally you’re taking tests and dealing with the social construct of high school while also figuring out what does it mean to have these powers? It’s totally Persona and I thought that’s a little derivative so, I won’t do that. The more poignant of Barlog’s pitches got at the heart of what Superman’s represented for 80 years. Then I really came back to an idea that I think everyone here was touching on. Superman was created at a time when we needed some idealistic, perfect person to aspire to, which is why he is so flawless. Like, literally, he almost has no flaws. And he’s extremely hard to work with when you’re talking at an interactive level. The one flaw, and I don’t think it’s really a flaw, it’s just who we are as human beings, is this idea of caring. I think the best thing you can do with a Superman game is to kind of explore the psychology of what it would be like to be a person who slowly beings to realize that he can’t save everybody. You begin the game and you are able to hear a little bit. Maybe he’s a little bit younger, or maybe he just started a little bit later in his life, but the idea is you begin to hear, as the player… help. You’re not helping Superman. You’re not Superman yet. Nobody knows about Superman. But when you start helping people you build up a reputation and then you start to hear, “Help, Superman.” And you start to hear more of these ‘help Superman!’ voices from all around. As the game progresses, as you do these sort of good deeds, more and more people are aware of you, they start following you on twitter—@superman—and everyone starts asking for help and this is where it really starts to unravel. As a Kryptonian and a human being a little bit, he has no capacity to sort of manage this. I don’t know if there is a form of brain where you sort of have no filter. Where you literally take everything in the world in? That’s who he is. He is taking everything in. When he chooses, or when you choose to save anyone in this game… Let’s say there are four people who need to be saved. At your best moment as Superman, you can save two. That means two were not saved and that weighs on him. It’s not the people that he saved. It’s the two people that he didn’t save, the crimes he couldn’t stop, and there is suffering that comes from that. The idea of this is, as you get to the beginning of the third act, you realize, as Superman, that the brute force method of fisticuffs, the idea of constantly trying to chase your tail to save people individually, is not working. You have to figure out a different way because the ultimate goal, psychologically, to maintain some kind of sanity, is to actually try and save everybody. It’s a great, idealistic, fantastic concept, but fairly impossible. So, the third act, Superman runs for president… of the world. I’m talking like Tommy ‘Tiny’ Lister from The Fifth Element who was like president of Earth. He is, through politics, going to bring everybody together. Doing good acts that actually reach out not to just one person, but influencing everybody in there own way to become Superman. They’re not flying around, but they’re actually having an effect on the world around them. Positively changing things. And, you know, the third act is just him filling out paperwork, cutting ribbons, doing speeches – I’m just kidding. The idea would be that he needs to reach out further, save more people, but really it’s the teach a person to fish, instead of constantly bringing them fish individually. Helping us all by helping us help ourselves. The struggle of trying to save everyone is prevalent throughout Superman comics. In media, it’s been most recently explored in The CW’s Supergirl series. Conveying this kind of tragedy for a nearly god-like being sounds impossible for a video game. However, having Superman save the world via politics, like Barlog suggested, could work wonders. It also echoes a sentiment made by Lex Luthor in Superman: Last Son of Krypton, a comic written by the prolific Geoff Johns and Superman (1978) director, Richard Donner. Luthor took the Boy Scout to task and told him that his god complex isn’t born of his power, but that it stems from humanity’s reliance on said power. How are we to evolve and learn if Superman’s always there to save us? Perhaps Barlog’s pitch answers this question—Superman’s leaping buildings in a single bound doesn’t inspire us to be better humans; he has to inspire us to help ourselves. 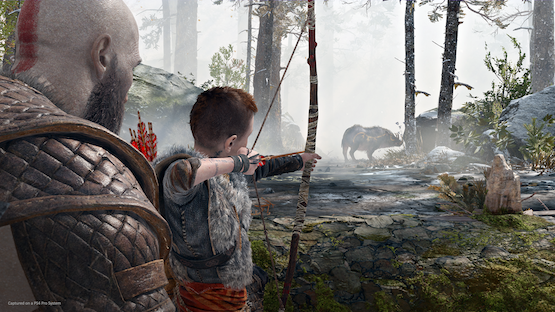 Once Barlog finished his pitch, someone from the audience asked what gameplay for such a title would entail. Barlog responded, “You noticed I didn’t mention that part, huh?” He did delve into what he thinks would work, though. I would not have him flying. I think he would have his ability of speed so you would feel like you’re playing a Flash game at the beginning. And I think for me that loop would start you out and you wouldn’t be able to fight anybody. You would be taking care of things that are less sort of fisticuffs so that you start to get your feet wet, and then the first time a baddie appears, somebody who is kind of an antagonistic force… you would feel just as uneasy as Superman would be. This would feel more like an origin story, like a Spider-Man 1 kind of feel that he is just figuring this out. After Rocksteady’s acclaimed Batman: Arkham series and with Marvel’s Spider-Man looking to become something special, Superman is past due for proper treatment in the video game space. Fingers are still crossed that Rocksteady will work on such a project. But, should that not be the case, we wouldn’t mind seeing Cory Barlog’s vision fully realized. According to him, the studio best suited to get it right is Ninja Theory, the team behind the award-winning Hellblade: Senua’s Sacrifice.